Rewatching the James Bond films chronologically. 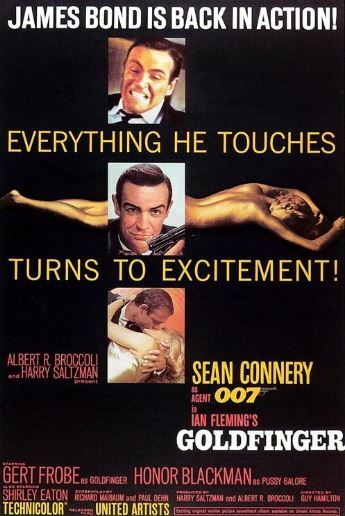 Movie number three is the one everybody loves, and certainly the one I’ve seen the most, Goldfinger. Bond blurb: Bond is on holiday in Miami when he gets a message to investigate Auric Goldfinger, who is suspected of being up to no good. A businessman with an interest in gold smuggling, Goldfinger wants to nuke Fort Knox, not just to make his personal gold more valuable, but also to go down in the history books as committing history’s greatest crime. Bond background: Even when on vacation, Bond is “on the job,” so we learn very little new info about him. Twice in this movie, bad guys get the upper hand on him when he’s alone with a woman. For as much as he’s the suave seducer, the ladies continue to be Bond’s blind spot. Bond baddies: Auric Goldfinger is an interesting villain. When we first meet him, he’s just some guy on vacation cheating at cards. 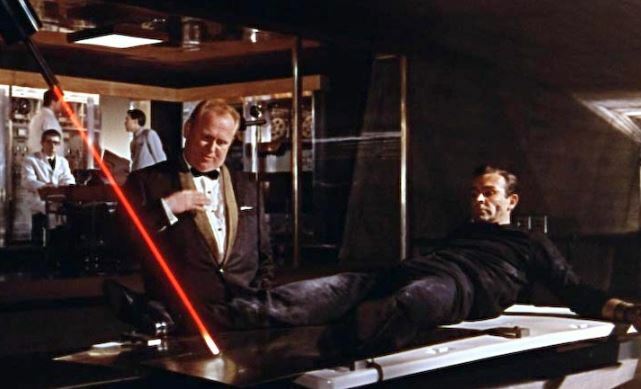 Notice that every time Goldfinger appears on screen, he’s a little bit more evil each time, and the stakes get raised with every new fact we learn about him. His henchman is Oddjob, the huge dude with the famous razor sharp hat. Bond babes: What do you suppose Mr. and Mrs. Galore were thinking when they named their daughter? Either way, you-know-who is a cool character. I imagine that if she’d never met Bond, she’d still be off having cool “action pilot girl” adventures. Bond also dalliances with an unnamed woman who betrays him in the pre-credits sequence, an assassin named Tilly, and a ditzy masseuse with the unfortunate name of “Dink.” Best of all, though, is the super-cute Jill Masterson, who becomes a movie icon after getting the death-by-dipped-in-gold-paint treatment. Bond best brains: It’s our first visit to Q’s wacky workshop, and the first appearance of Q and Bond’s stuffy teacher/wisecracking student repartee. 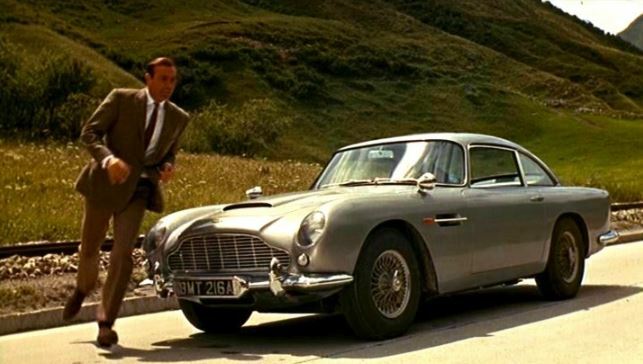 Q supplies Bond with his Aston Martin car, ‘roided up with all kinds of weapons and gadgets, including the always-popular ejector seat. Bond bash-ups: The Aston Martin gets in on the action so much that it’s practically a supporting character. There are not one but several car chases for it to show off its gadgets. 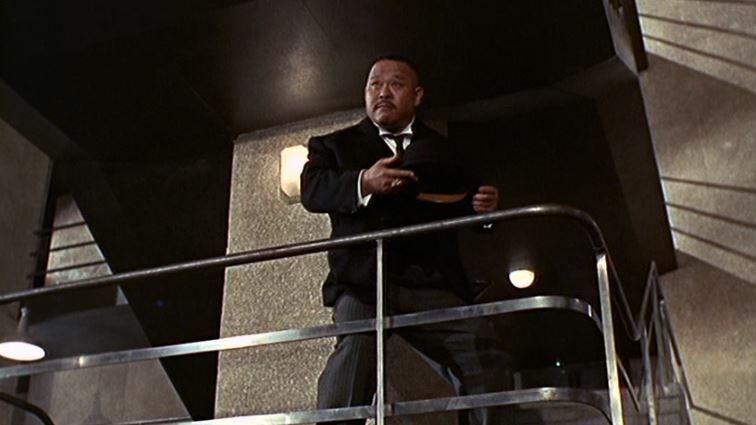 The climactic gunfight inside Fort Knox is excellent, right up there with any of today’s action movies, and it ends with Oddjob going out in spectacular fashion. Bond’s final confrontation with Goldfinger is a little cheesy, but the movie totally has the audience on board by that point, so it’s OK. Bond babble: Goldfinger’s reputation as a classic is well deserved. There’s just so much to love about it – wearing the tux under the wetsuit, Shirley Bassey’s superhuman lung power during the theme song, the laser beam to the crotch, hiding under the model, the bomb’s final countdown, and so much more. One of the best movies ever made.